A few weeks ago, The Wedding Date and I had our second argument. It was more of a debate actually—there was no using of profanities or slamming of phones—but unlike our first argument/debate (which centered upon the ridiculousness of Beyonce’s 1.3 million dollar birthing suite) this one mattered. It was about gay marriage. And Chick-fil-A. I told TWD that if he supports gay marriage (which he claims he does), he should stop eating at Chick-fil-A. He told me that I can’t consider myself a tolerant, open-minded individual if I go around telling other people what to do, that the owner’s of Chick-fil-A have a right to say whatever they want and finally—this was the real kicker— that his little five dollar sandwich wasn’t going to make a difference. I was mad. But more than mad, I was disappointed. Don’t you know how lobbying works? I demanded. And what about the civil rights movement? Are you honestly going to sit here and tell me that boycotting doesn’t work? In the end, we agreed to disagree. But as I hung up the phone, I felt as though our big red balloon of love had sprung a leak. It’s been ages since I’ve been to a rally or the halls of Congress to speak to my elected officials but I have very little respect for people who don’t believe in their ability to affect social change (and even less respect for people who won’t put their money where their mouth is). And as respect is a basic precursor to love in my book, I felt let down. How could the man I love be so foolish? But now that the election season is upon us, it’s not just the The Wedding Date. And it’s not just Chick-fil-A. It’s everyone. At least everyone who prefers the RNC to the DNC, and I hate that it has to be this way. And one of the brothers responded. And—go figure— it wasn’t all high fives and hugs this time. I’d put two and two together by then: they were Mormon, and very, very Conservative. As such, I wasn’t exactly surprised by the response to my comment, but I was saddened by it. He was such a nice guy. As in I do not think he’s a very nice guy anymore. I think he’s an idiot. 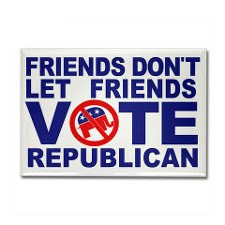 I have plenty of Republican friends (and plenty of Republican blog readers if my memory serves me correctly). My usual MO is to simply avoid talking politics for the sake of these relationships but every once in a while I can’t help myself. Reproductive rights really push my buttons these days, and so do healthcare and access to education. I start to wonder: is it better to ask the tough questions, to walk the walk? Or is better to resist the trend towards us vs. them, Democrat vs. Republican? It’s not even the potential loss that I’m worried about—I lost friends in college because of my involvement with ANSWER and I got over it—it’s the labeling. It’s the “You are an idiot because you don’t see the bigger picture. You are an idiot because you don’t realize that you were born to privilege. You are an idiot because you still don’t believe that global warming exists and that an investment in a green economy is the only way to get ourselves out of this economic crisis. You are an idiot because not everyone has the means to raise a child or go to college or pull themselves up by their bootstraps like your parents did. You are an idiot because you don’t realize that we are all immigrants or children of immigrants. You are an idiot because you believe what people tell you about the Bible (and these people also idiots because they have conveniently forgotten the meaning of “turn the other cheek”). And that is why I hate this time of year. Even Ronald Reagan (who I absolutely despise as the guy who started this whole march to the right and decline of the middle class) said, and actually kinda believed, “we can disagree without being disagreeable” albeit easier said than done. I am very quick to label and even though I know better, I generalize that conservatives I know are idiots much too often and too quickly. It is hard not to do so when you are passionate and are faced with opposing viewpoints. So don’t be too hard on yourself, I too have lost friends and some business because of my “vocalness”. Some friends are dear and you do have to agree to disagree, then look at the whole package,… and of course determine that their friendship is more important. Others,… let them go, maybe they were not such good friends in the first place. We lost many friends in Freehold over a single hot button issue we were involved with, and I do not miss a single one of them. Because of that single hot button issue, we made many more wonderful friends and they are people I would rather be associated with. Be true to yourself and your opinions, but be considerate and open minded too. (I should mention, that last part is a work in progress for me). Kat, KAT! Now I\’m getting upset. ALL Republicans are idiots? Really?? All? Well, you just called me an idiot. As you know, I\’m a Republican. Growing up bleeding-heart liberal, I never thought I would be a pariah if I changed political parties. But it\’s people making sweeping statements, like you just did, which feels like peer pressure to be a Dem. But I\’m not going to do that. I\’m staying Republican, even being ostracized. I\’m a Woman Republican for Obama, does that count? Or am I still an idiot? I have conservative views, but I\’ve never posted them. They are MY views and I don\’t want to throw them on others. But I\’ve blocked some people on Facebook because they were making me physically ill with their mudslinging. They are behaving like idiots. I don\’t want to do this to you, but with sweeping generalizations like that, I might have to block you as well. Jenny, read a little more carefully — in the “idiot” paragraph near the end, she’s saying she hates that part about elections. She hates making those own generalizations inside of her own head. It’s just hard to get through a blog entry where I feel insulted by reading the title. As for the title… its a blog. I’m sorry you took offense but the sentiments expressed are the entire reason I decided to write this post. Oh, dear. As Clinton would say, “I feel your pain”. When I was your age, (roughly 40 years ago! ), one could have a conversation with Conservatives and Republicans and talk about issues and theories of governance and ‘why we felt that way’. Today, not so much. Part of it is media. Part of it is propaganda. Part of it, imo, is that Barack Obama has brown skin and a funny name. The people who are bankrolling the rightward push in the country, ALEC, the Kochs, etc, use the social issues and racism to enlist ignorant people to vote against their economic self interest. It is propaganda in the worst sense of the word. It started back then, though, with Richard Nixon’s ‘southern strategy’. No one on the other side is an idiot. The puppet masters are selfish, greedy and megalomaniac. The masses are ill informed and manipulated. They see themselves losing their status and ‘power’ and are vulnerable to folks who stoke those fears. That is my opinion and I’m sure it is no less offensive than the way you expressed yours. The one very conservative friend I have unfriends me on FB during election season. It breaks my heart that I cannot get through to her, but she believes that the earth is 6000 years old and if she believes it, that makes it true. We agree to disagree on many things, but during election season, we agree to disengage. Maia, you hit the nail on the head. ” The puppet masters are selfish, greedy and megalomaniac. The masses are ill informed and manipulated. They see themselves losing their status and ‘power’ and are vulnerable to folks who stoke those fears.” Very true and sad at the same time. Thank you for that, Maia. I think disengaging might be the solution! This is a very tough one for me. I’m originally from the midwest and still have family back in Boonie Land. They are there when needed, friendly and make great neighbors. But, they are small town, very conservative and — as you said — idiots. When I return for visits we steer clear of politics, and I am reminded — again — why I left rural Ohio. Exactly… it’s like where do you draw the line? Are you still a “good democrat” if you allow yourself to remember the fact that they’re good people despite their small town mentality? Both sets of great-grandparents came over on the boat from Poland and settled in Philadelphia. From what I can understand of their history, everyone in my family voted Democrat. They were poor factory workers, and while they were all deeply religious Catholics, religion didn’t factor into the political decision at all, (unlike today). My father and mother got a Republican bent about 30+ years ago. I don’t really know the origins of why they changed. A small part of it related to the right-to-life movement, but mostly, my dad is really anti-taxes and big government. Whatever works for them. However, ever since the Bush-Gore election, it seems like the word Republican is another word for extremism. Extreme right-wing nut jobs seem to have taken over every political office position, they are all over the news spewing extremist, hateful views about city people, religion, people who have names that aren’t American, (remember how in the 2008 election there was this thing about how Barack should go by “Barry” if he was really like “us), people who have college degrees, women, gays, reproductive rights, the arts, guns. Is this really Republican, is this really what the party stands for? I am scared for my children if these extremists obtain more power. They certainly don’t speak for me or my family. As a side note, I always find it interesting that Republicans target President Obama for being a policy wonk or too intellectual. I have never understood why being educated is anti-American. It certainly wasn’t in my family. Education was the ticket out of poverty and the road to a better life. Rushing…what I left out is that the Democratic party used to be the political party of the working class. Again, agreed agreed agreed. I think this is the “propaganda” Maia was referring to above. They’re distracting us with issues that do NOT belong in the government. It’s crazy! I want a Chick-fil-A sandwhich soooo bad, but every since their blatant support of a hate-group, I’ve resisted. To me it’s not about their views, but how they express them. I’m okay with someone supporting a conservative agenda. I’m not okay with someone supporting a hateful agenda against someone/anyone else. Thanks Katie (and thank you Jenny for contributing to the discussion, even though its pretty clear we don’t see eye to eye on this one). I wrote the first draft of this several days ago at this point and then hemmed and hawed for a while about actually posting it because I DIDN’T want to offend people. But then I went out with TWD and my roommate from college last night, had a bit too much to drink and realized I didn’t have anything else to post this morning so up it went! That’s not to say I didn’t mean what I said– I do mean it– but this wasn’t meant to be an accusation. It was meant to start a discussion about how polarized this country has become (and how Facebook and other forms of social media make it even easier to declare ourselves in one camp or the other), and how unfortunate it is that we didn’t listen to the founding father when they warned about the dangers of a two party system. The next few months are gonna be interesting! As always, your blog leaves me smiling and agreeing. I’m this close to talking to the computer when I read your blog. (Pretty sure that would make me look crazy to the guys I work with). And I agree with Katie…a very Brave post indeed. I have quite a few gay friends and have participated in rallys since highschool supporting their rights. I even wrote an article in our local newspaper when I was in highschool about gay marriage. I was SHOCKED when I found out that some of my closest relatives do not believe that gay marriage should be legal. I just wanted to smack them upside the head and ask how they could be so closed minded. If you haven’t yet, you should go to youtube and check out some of the videos of people interviewing those supporting chic-fil-a. There was one girl who said that the constitution defines marriage as being between a man and a woman. The stupidity of some people is just amazing. I pretty much agree with you 100%. I think the whole issue is that people really are uninformed and uneducated in what they “believe”. I’m torn who I’m going to vote for at this point. I would say I’m more democratic than republican for sure, but Obamacare scares me and is making me hesitate to vote for him. Romney, to me, really is the epitome of a slimeball South Baptist pastor. I work in the commerical healthcare industry and I’d like to think I’m fairly knowledgeable about Obamacare and how it’s going to affect health insurance plans and based on what I know about the two, I don’t know how it can be succesful in the long-term. The American healthcare industry is such a different animal than any other nation’s healthcare industry. I’m not saying I don’t think everyone should have access to health insurance, I just don’t think Obamacare is the answer. And honestly no plan, in my opinion, will work until the healthcare industry is reworked and overhauled. Isn’t that what the health reform act is trying to do? Unfortunately, it ended up getting so watered down just to pass that it hasn’t had much of an impact yet but I DID get a refund from my former health insurance provider because of the new requirement that they actually have to spend a certain percentage of what they take in. It’s not perfect, but its a step in the right direction. Kat, I’d like to read more of this kind of thing here! If you’ve got views, voice them. As long as you’re writing what you believe, it doesn’t matter whether some of your readers disagree. I think you’ve got a LOT more to talk about than dating and I’d be sad if you kept to the same theme forever. But the way, I’ve never met a person with Republican leanings. Europe, which Republicans like to refer to under the entirely inaccurate term “socialist” see good healthcare, education access as indisputable goals which any democratic country must strive towards. I know… a friend of my mine from London recently posted on Facebook that she’s just managed to schedule a walk in appointment and blood work on the same day, and managed to make it to all three of the places she needed to go via mass transit in a single morning. That would NEVER, EVER happen here. And don’t even get me started on our “definition” of socialism. Arghhh…. I apologize to all for running off at the mouth. It’s not you guys, it’s not this intelligent conversation. It’s how this whole thing has become for me. My family is completely divided and name-calling all over the place. Really low blows. And I came very close to puking when I saw some kind of “fact” about a candidate engaging in a method of animal cruelty that I can’t even repeat. Suffice it to say it was like watching an ASPCA commercial you couldn’t forget. I don’t get it. It’s one thing to express an opinion, but something completely different when the expression of an opinion is absolutely cruel. This is where I’m coming from. I’m frustrated, and tired. It’s not you guys, and definitely not you, Kat. WOW, WOW, WOW, I am on my back from the DNC, where I spoke to all kinds of democrats (newly crossed over, Conservative Dems, moderates, mixed couples: R & D, and of course progressive and like me, liberal patriots 😉 I am at a Panera taking a break from the road and find this title in my inbox, and think to myself, “NO KAT don’t go there…I just got finished telling Chauffeur to use more diplomacy in his discussions for the next two months!” Of course, I shouldn’t have worried, my daughter you are a terrific writer and I agree with Kate F, more of this is stimulating and dearly needed! One of my conversations this week was about how many of us really liked McCain back when he was sane and prior to his becoming groomed for the the presidential run. He was a moderate Republican I could have voted for at one time. Another oddity is the “so-called” liberal media being blamed for so much, when there is nothing liberal about any of the mainstream news and that includes MSNBC, which may be more balanced than others, but that is about it. Yet we have been brainwashed that it is an “us versus them” country, up to and including the news that we receive. How can it be news then? And not just one giant, all consuming, never ending commercial to reinforce what we already believe? If there is one thing that the new generation should strive towards with all of their “plugged in” capabilities, is to use their skills reading, sharing, and dissecting what they believe because THEY HAVE used independent media sources and complete (not partial) facts for their decisions. After doing that, a realization that NOTHING is black and white will go a long way to learning to agree to disagree, and soon we can go back to going to the voting booth, looking at each candidate for every office, each resolution and choosing which one, no matter what party affiliation, is the best one for the country, notice I did NOT say for YOU, we are part of a large civilization, and as such we need to make decisions based on the larger good. Just as the vast majority of the ten thousand things cannot be categorized as simply black or white, so the vast majority of Republicans cannot be categorized as idiots. As with a child, one should not condemn the person, but the behavior. Republicans have nominated a candidate who seems to stand for nothing that he would not change his mind about in a couple of minutes, who has chosen a misanthrope for a running mate. This is plainly idiotic behavior which should and will be addressed. Naughty, naughty Republicans. We know you are smarter than that. And show us those tax returns right now, or go straight to your room, Mitt.